A composite filling is also sometimes referred to as resin dental fillings or tooth colored fillings due to the striking resemblance to the natural color of your teeth. Composite fillings in Thailand are a minimally invasive and cost-effective solution for damaged or decayed teeth and offers longevity for the treatment of small to average sized cavities. These type of non-painful,non-toxic composite dental fillings require less trips to the dentists and can be accomplished is as little as 1 day in Bangkok or Phuket. Our Resin white dentin fillers also cost much less than traditional amalgam fillings. We offer are several cosmetic dentistry treatments choices for our clients looking for safe and affordable dental repairs. Treatments like porcelain vaneers and resin fillers are the most common types of dental treatments in the world and include 2 types of fillers including the newer safer composite fillings and the older less desired and sometimes toxic amalgam fillings. 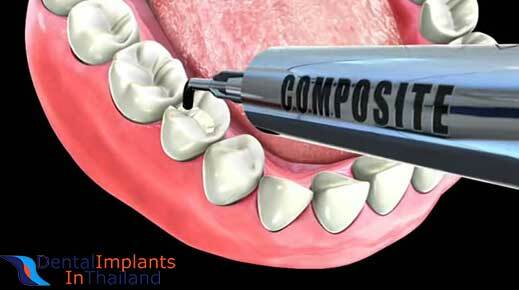 Due to their natural color and appearance, Composite dental fillers are preferred over amalgam fillers. Natural white fillers are especially well suited for dealing with noticeable areas such as the front teeth. Composite fillers in Thailand allow you to quickly replace your existing silver amalgam or metallic based dental fillers with natural white tooth-colored resins that are much more secure,safe,powerful and visually pleasing. The white composite fillings used by our approved list of Thai Dentists in Bangkok and Phuket will match your natural teeth color while forming a more powerful bond to your tooth. Another great perk of having white composite fillings in Thailand is the ability to have much less sensitivity to hot or cold temperatures. Extreme sensitivity to temperatures is most often associated with the amalgam fillings of yesteryear. When our clients from Australia,UK,New Zealand or the US are dealing with a painful cavities, they come to Thailand to get the same exact treatment they would receive back home but for a fraction of the price. 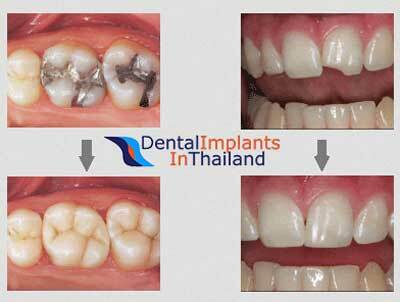 Our hand selected team of the top dentists in Thailand can help you eliminate any decayed portions of your teeth and safely fill then with an additional dental compound filler. The treatment begins when your chosen dentist in Bangkok or Phuket numbs the area where the new filling are going to be placed. 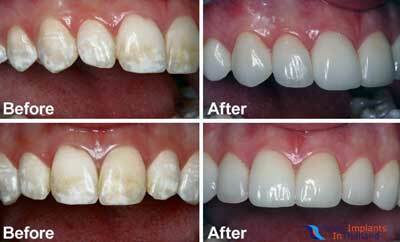 The dentists’ will first try to eliminate any decayed area and clean the surroundings. Once the decay and cleaning is complete, they begin the filling process by gradually using thin layers of filler material to slowly create the desired shape and structure of the dental fillings. How long do Fillers take to install? 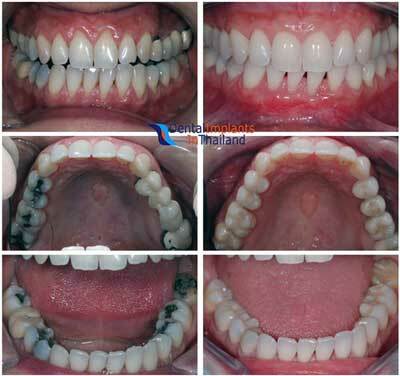 Our dentists can prepare and install your new fillings in just 1 visit. Unlike traditional metal fillings from the past that took way too long, the new composite fillings are instant and will only require a 1-3 night Thai Dental Holiday. 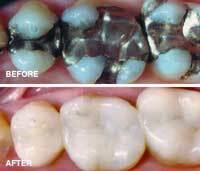 The Composite fillings we offer are made from the best quality materials on the market today, and the results should last atleast 10 years as long as you take care of them. The Dental Center Thailand suggests brushing your teeth at-least two times a day along with occasional rinsing/cleaning between meals. Flossing is also an essential technique in helping eliminate plaque in between the teeth. Long term plaque buildups in these areas can trigger accelerated dental decay and/or gum disease. The prices for composite filling will depend on the total number fillings needed along with the materials used and the underlying conditions of your teeth. To determine actual prices and get multiple-area discounts for your composite fillings in Thailand please contact us with specifics. Generally, the prices for just any package start as low as $25 per tooth with even more discounts for multiple areas. Dental Composite Fillings in Bangkok or Phuket can help you rejuvenate your mouth and achieve amazing results in as little as 1-3 nights in Thailand and for nearly 45%-65% less than the price of composite fillings you would expect to pay back home. We also offer complete package that include your treatments,hotel and transportation for you and a guest. To see if having composite fillers is right for your or if you would like to learn more about our affordable medical tours & cosmetic dental makeovers please contact us today.